I had the pleasure of seeing Taking My Parents To Burning Man at a recent super stealthy screening. Alright, truthfully, I know the producer, but what I’m trying to say is, I know what I’m about to talk about so you should take note on this one. Taking My Parents to Burning Man is on the film festival circuit and being the smart people I know you are, you will do exactly as I say, run don’t walk to the theatre and go see this documentary. What makes this film so special is the authenticity that surrounds it; from the love the filmmakers obviously have for Burning Man, to the open and fresh-faced wonder you experience through the eyes of the parents. Taking My Parents to Burning Man teaches you that age doesn’t have to affect experience, friendship, or the potential to learn new things about the world, or ourselves. If you don’t believe me, then ask the already seven sold out screenings at the festivals it’s played at. That’s right, seven, and at events like the Newport Beach Film Festival where it won the Audience Choice Award for Feature Documentary, and The Sonoma International Film Festival where, you guessed it, they also won the Audience Choice Award. If that wasn’t enough, throw in a private screening at Pixar and, well, you get the message, this is a can’t miss film. Taking My Parents to Burning Man chronicles the adventures of Spry Bry, a DJ, entertainer, and party-monster extraordinaire. The guy has it going on. His parents are nice, good, decent people. They are supportive and loving, and not who you would typically think would be willing to take on Burning Man in front of a camera. But they do, and the way they and their lives change (for the better) is the main reason you need to go on the journey with them. By the end of this movie, you want to be their friends, their children, and their dinner guests. This is a great film with a huge heart. The visuals of Burning Man are stunning, and yet that’s the least impressive part of it. What makes this film so special is that it connects with something in all of us. It speaks to a universal need to share, love, connect, and experience in a world devoid of politics, agendas, or deception. This is the heart of Burning Man as an event, and it’s the heart of the film. The Rio Theatre in Vancouver is home to two screenings of Taking My Parents to Burning Man. The shows on May 30th and 31st are already 70% sold out. I suggest you get you get a ticket before the other 30% are gone. It’s the kind of movie experience we just don’t get enough of anymore. Want to know more? 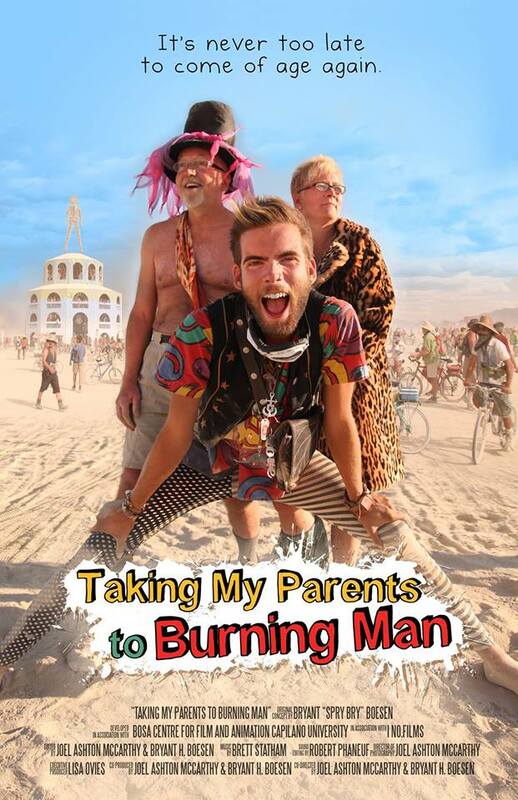 Check out the Taking My Parents to Burning Man Trailer.